While tonsillitis is one of the most common conditions we treat, there are many kinds of throat and voice disorders that can cause your child problems and discomfort. At Wolfson Children’s, we offer children with throat and voice problems access to expert care in a world-class setting. From advanced technology to extremely knowledgeable pediatric ear, nose and throat (ENT) experts, you can rest assured that your child will receive an accurate diagnosis, followed by the best care in the region. Children with airway obstruction caused by enlarged tonsils or other blockages at the nasal passage can develop obstructive sleep apnea, a breathing disorder that causes short pauses in a child’s breathing. This disruption can result in daytime sleepiness and other complications. Our board-certified sleep medicine specialists expertly diagnose the cause so a treatment plan can be coordinated. We bring together experts from pediatric otolaryngology, as well as support from specialized nurses, speech-language pathologists, social workers and more to create a plan for initial treatment and ongoing care to meet the specific needs of your child. 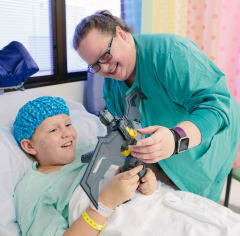 Our ENT services at Wolfson Children’s Hospital help children from North Florida, South Georgia and beyond. We’re located on the south bank of the St. Johns River in Jacksonville.